Home / Special Report/ ‘Little Lives’ changes lives! The ‘Little Lives’ Fundraiser was started by four mothers to help ensure that these words no longer have a place at the Neonatal Intensive Care Unit (NICU) of the De Soysa Hospital for Women (DSHW), the first maternity hospital in Sri Lanka. The DSHW is a tertiary level hospital and many expectant mothers and premature babies from around the country are sent here for specialist care. 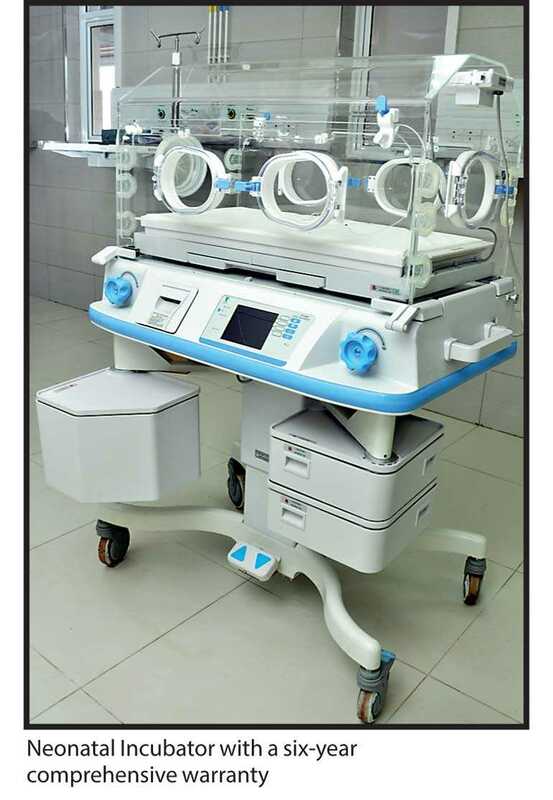 As the number of deliveries in the hospital and transfers of mothers and babies from peripheral hospitals to DSHW increase, the improvement and expansion of neonatal units at the hospital, particularly units such as the NICU, which provide highly-specialised care, remains a high priority requirement for the hospital staff. The ‘Little Lives’ fundraising team comprises Thushanthi Ponweera, Dr. Ashwini de Abrew, Amila Jayamaha and Marianne David, who are all members of a Facebook support group for local moms. Continued Amila, “I knew Dr. Nalin Gamaathige, one of the consultant neonatologists at the De Soysa Hospital, as my son’s paediatrician, so we contacted him to ask if we could support the hospital in any way. I actually asked him if we could buy diapers for the babies at the hospital! At the time, we only thought about how best we could utilise the funds already collected. The team then started a dedicated Facebook page, ‘Little Lives – Fundraiser for NICU at De Soysa Hospital for Women,’ so that fundraising could be more organised and transparent. “It helped people to connect with us, and many shared stories of how, as parents, they have gone through many heartrending moments when their new-borns needed intensive care. Many of our supporters wanted to use this opportunity to give hope to other families facing similar situations and help improve the capacity of the hospital and the NICU team to help more babies born too soon, or needing support in the early days of their life,” added Ashwini. For the team, being moms themselves, the goal was to make a difference in the lives of newborn babies. “We’re happy to have found a way we could give not one but many neonatal babies a fighting chance at life … which is how the name ‘Little Lives’ came about,” said Thushanthi. In line with the fundraiser’s tagline, ‘every little counts,’ ‘Little Lives’ called on people across all walks of life to join in to support the hospital NICU and be a blessing to babies born too soon. The initial aim of ‘Little Lives’ was to raise Rs. 1.7 million for a neonatal incubator. “Soon after we launched the appeal, we were actually worried about whether we would be able to raise such a huge amount in such a short period – but then the donations started pouring in on a scale we never expected! Some promised to deposit once their salary came in and did so, while others were able to donate huge amounts immediately. Each and every donor made heartfelt contributions in whichever way they could, which was truly inspiring!” said Marianne. Within the course of four months, the ‘Little Lives’ initiative had raised Rs. 3,145,383.28 (with all donations, bank account interests and deductions of withholding tax accounted for). This was far in excess of the initial target and ‘Little Lives’ was able to purchase several items, all vital to the health of newborn babies, from the list of required medical equipment provided by the consultant neonatologists at the hospital. Dealing with public money requires a high level of accountability and transparency, especially when individuals take on the task of fundraising for worthy causes. The team opened a dedicated account for ‘Little Lives’ with three signatories needed to operate the account. This account has now been closed with final payments being made to suppliers after the handover of all purchased equipment to the hospital. The ‘Little Lives’ Facebook page helped to draw in many supporters who contacted the team and expressing willingness to purchase equipment, said Marianne. Where such requests were made, the team supported the procurement process and coordinated the handover to the hospital in instances where the donor wished to be personally present. These donations were also highlighted via the ‘Little Lives’ Facebook page. Medical equipment to the value of Rs. 2,698,820.00 was donated to the De Soysa Hospital by supporters either as individuals or as a collective in support of ‘Little Lives’ – a huge success for the fundraising initiative! With these donors who joined the effort, ‘Little Lives’ resulted in the hospital receiving nearly Rs. 6 million worth of equipment over the course of the fundraiser. The ‘Little Lives’ team sent letters of acknowledgement to everyone who donated medical equipment. Each and every donation of medical equipment will be officially acknowledged by the Director of the De Soysa Hospital, with some donors already having received their letters from the hospital. The team also ensured that proof that the equipment donated had been entered in the hospital inventory was shared with donors. The team is thankful to all those who contributed and supported ‘Little Lives’ in multiple ways. People spread the word by sharing the dedicated page and posts and urged family and friends to donate. Some voluntarily took on the role of collection points in Australia and the UK to channel donations from overseas to ‘Little Lives’. A business run by a member of the Facebook support group for local moms, designated ‘Little Lives’ as their preferred charity initiative for the year, generating added publicity and donations. Collections were taken up in workplaces. School societies and past student groups came forward to donate, providing both cash contributions and donations of medical equipment. One individual in London even got together with her work colleagues to sell ‘Sri Lankan rice and curry’ in their workplace to raise funds. Why did people support ‘Little Lives’? Because of their personal experiences. Because it was a worthy cause. Because of the confidence they had in the initiative. Because ‘Little Lives’ was making a difference. The team hopes that ‘Little Lives’ will be a source of inspiration to those who wish to support a good cause or a fundraising drive. The initiative, commitment and passion of four individuals resulted in the De Soysa Hospital receiving medical equipment beyond initial targets in a matter of four months – what then isn’t possible? And that’s what this little team has successfully done – help lessen the burden on parents and doctors at the De Soysa Hospital for women and give little ones in the neonatal units the best chance at life! The new building of the De Soysa Hospital for Women was formally opened on 13 September by Minister of Health Dr. Rajitha Senaratne. The NICU and neonatal units are now housed in a modern neonatal centre with more room for equipment and for staff to work in, with the positive impact of enhancing the excellent quality of care already being provided by the staff of the neonatal units. On Friday, 14 September, a ceremony was held at the new building to hand over medical equipment purchased with funds from the ‘Little Lives’ fundraiser. At the time, the hospital had two main problems, said Dr. Gamaathige – insufficient space and insufficient equipment. Following several meetings Dr. Gamaathige had with the Hospital Director and the Ministry, Minister Dr. Senaratne agreed to complete the new building and granted the funds in 2016. Work on the building was started in early 2017 and it was declared open on 13 September. “One goal was achieved! But while the building was being completed, we knew we didn’t have the equipment even though we had made requests to the Ministry. The old NICU had four beds but the new one has space for 16 beds. The Government yesterday agreed to fund as much equipment as possible but soon after the funds for the building were passed, we knew we couldn’t wait until the Government supplied everything, we couldn’t let the babies die. In my personal capacity, I spoke to people who provided some equipment on and off. Then I met Amila, who brings her child to me. One day, she asked about this and that’s how this donation came about,” said Dr. Gamaathige. While Sri Lanka is rightfully proud of its health statistics, it is worrying that babies are still dying of preventable causes. The hospital’s mission is to bring the neonatal mortality rate down from 5.3 to 4.2 per 1,000 live births by 2020. However, this cannot be achieved without investing more money in neonatal care. “We need a lot of equipment to look after these babies. Our fantastic team provides every possible care to these babies with minimal equipment. My motto in life used to be ‘everything happens for a reason’. The day that baby died, I realised this was not true. Since then my life motto has been that if you help people and patients, you can save lives and merit will follow. I am delighted today that ‘Little Lives’ enabled the donation of this equipment. According to the World Giving Index, Sri Lanka is within the top 10. We are lucky to live in a country which enables such acts due to the generosity of its people,” concluded Dr. Gamaathige.